Dozens of Muslins is a mom & pop & son business that supplies original, hand-painted backgrounds to hundreds of photographers and event planners across the country. In the early eighties David and Jadyne, (the mom & pop components – Jason, the son, was more concerned with first grade at the time) founded David Buchholz Photography, a portrait studio in Santa Rosa, in Northern California. They quickly secured the contracts for many of the area’s high schools, and went to work documenting the decade’s amazing hairdos. Over the years, our sets for Homecomings, Turnabouts, and Proms grew more and more elaborate. Full-sized rickshaws, Harley-Davidsons, and antique cars were all called into service as we created unique, unforgettable images. (As we write this we cannot help but recall the girl who was disappointed that the show-quality ’49 Mercury coupe we’d arranged for one dance “didn’t match” her dress!) The exhaustive time and energy we spent creating these sets (we once brought in real sod for a garden prom scene and irreparably stained several new pairs of high heels) demanded we find a simpler solution, and because we weren’t satisfied with what the market had to offer, we began to commission custom scenic muslins from local artists. Dozens of them. We made our inventory available to other photographers and the word quickly spread. Soon we were shipping our backgrounds to all corners of the country, while continuing with our busy shooting schedule. 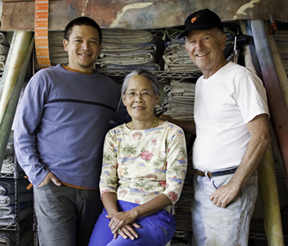 In 2004 we moved our many muslins to the East Bay and are now devoting all our time to serving our rental customers. And while we miss the hairdos, we love being in a position to help photographers create memorable moments for their clients.